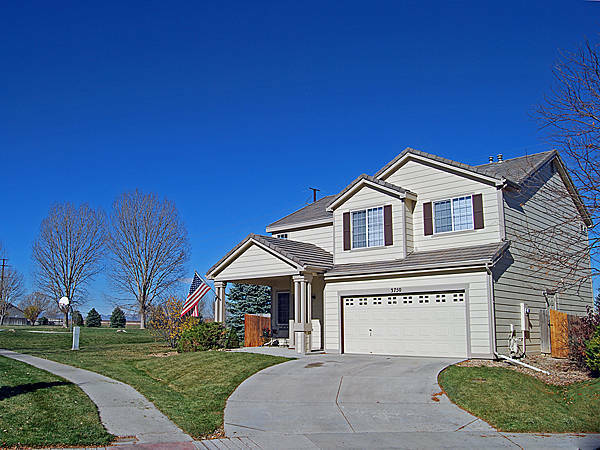 This lovely Waterglen 2-story home is located at the end of a cul-de-sac and bordered on two sides by open space, with nice views of the Front Range. It offers 3 bedrooms and a loft; 2 & ½ baths; a living room with 2-sided gas fireplace and a vaulted ceiling; a family room; a spacious eat-in kitchen with lots of nice oak cabinets and a pantry; a master bedroom with a 4 piece 3/4 master bath and walk-in closet; a 2-car garage with a service door; and a fenced back yard with a patio. Extras include central A/C, nice laminate flooring on main floor, laundry room, automatic sprinkler system, video surveillance system with 4 cameras, and much more. Pool membership is available. This home is in move-in condition and is offered for sale for $275,000. If you would like to browse other homes like this one, take a look at 3 Bedroom Homes for Sale in Fort Collins CO. When you find one that interests you, please give us a call - we would be delighted to schedule a showing for you at your convenience.